Hearthstone went on a huge card reveal bender on Friday and Shacknews is taking this week to catch up on the newest Grand Tournament expansion cards. Today, we look at the latest cards for the Druid and the Hunter. Just when it appeared that Shacknews had caught up with the newest Hearthstone Grand Tournament expansion cards, Blizzard went on a tear over the weekend, revealing the expansion's final cards. With dozens of new cards revealed, Shacknews is right back on the horse to break them down. And the best way to break them down is by individual class before going on a huge tear with the final neutral cards. So today, we're checking out the latest expansion cards for the Druid and the Hunter. The Druid's minion removal spells often have some notable drawbacks to them. Naturalize is the key one, as removing a minion for cheap is almost offset by its card draw effect that can give an opponent just what they're looking for. Mulch doesn't look to do anything particularly better than Naturalize. In fact, its drawback can be worse, depending on the circumstances. It's all in the hands of random chance, since destroying a minion that can be offering trouble now might inadvertantly give the opponent a new Legendary to play. 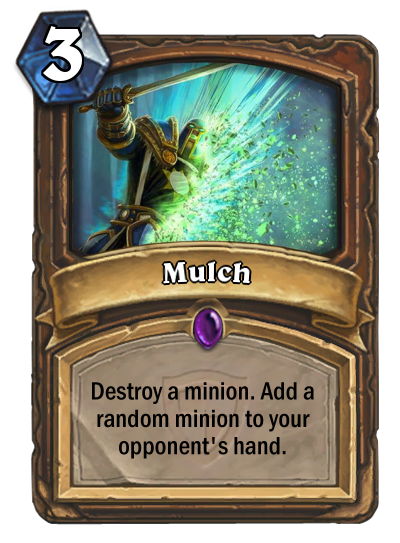 Mulch can be fine in case of total emergency (like when there's nothing else to deal with Kel'thuzad or Ysera), but for the most part, there's no compelling reason to pack this in when Naturalize serves the same function for a much cheaper cost. There aren't a lot of Druids that rely on beast minions, unless they're specifically setting up for the Druid of the Fang combo. 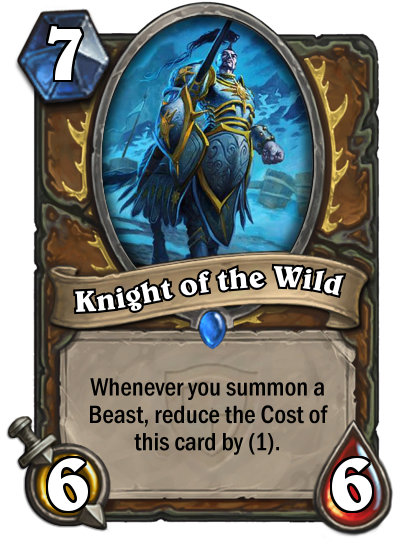 So it's interesting to find Knight of the Wild, which relies on Druids filling their decks with neutral beasts. Unfortunately, there aren't a lot of usable neutral beasts worth packing in a deck. Maybe a case can be made for Haunted Creeper, Oasis Snapjaw, or Ironfur Grizzly, but this type of deck strategy just isn't all that common. And to center such a deck around a 6/6 minion doesn't sound like a worthwhile endeavor. Here's another Druid minion that works with a number of neutral beasts, but the effect looks to be slightly more interesting. In essence, this is the Temple Enforcer effect for a slightly lower cost. And while the uses are a lot more limited in this instance, there are some useful beasts that could benefit from some savvy synergy plays. The first one that comes to mind is Oasis Snapjaw, which can be used to 10 health. While a 2/10 minion doesn't sound all that inspiring, beefing it up with Mark of the Wild could make it a lot to handle. If you're looking for a later game application for Wildwalker, why not use that effect on the much more effective Maexxna? With Mark of Nature, Maexxna can go all the way to 2/15 with Taunt and still kill on contact, making it a nightmare to deal with. On top of all of that, 4/4 stats aren't too shabby, either. Of course, if you dont like dealing with beasts, feel free to discard this minion for another 4-mana stalwart, like Piloted Shredder or Spellbreaker. For a 7-cost minion, these are some paltry stats. There's absolutely no chance this stays standing for more than one turn. But let's face it, every seasoned Hunter can see just one use for this guy. 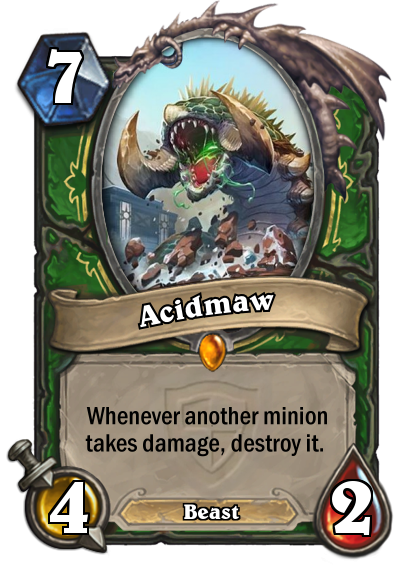 Yes, Acidmaw pretty much turns Unleash the Hounds into explosive killers. Because all of the Hounds have Charge, the effect will kick in on whatever minion they touch. 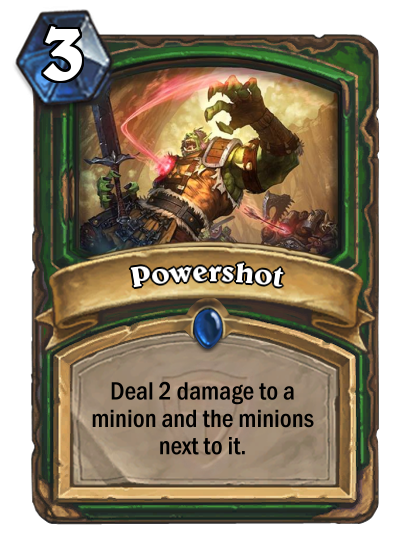 This means Hunters can pretty much clear the board on Turn 10 without a second thought. The trouble with Acidmaw is that it fits nowhere in the current wave of Hunter decks. Face Hunters will scoff at this guy, since they should have their game well in-hand before his situational use would even arise. With the additional tools given to Face Hunters in this expansion, Acidmaw becomes a superfluous addition. There are better minions to slot into this spot, especially with Gahz'rilla also available for the same cost. Interesting to see another Hunter Legendary with the exact same stat line as the last one, only for less than half the cost. Dreadscale acts as a mini-Baron Geddon, dealing damage to all other minions at the end of the turn. On the surface, he's an interesting play, because he could help set the table for an Explosive Trap, making a field a 3-health minions easier to deal with. This minion can also work with the myriad of Enrage minions, giving them a good place in a Hunter deck. 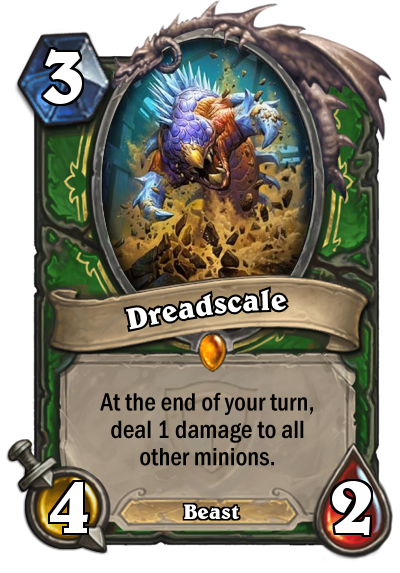 However, Dreadscale actually becomes more dangerous in the late stages of the game. We just mentioned Gahz'rilla and he'll be the one to benefit the most from the Dreadscale effect, as the end of each turn will perpetually double Gahz'rilla's attack power. This forces the opponent to either deal with Gahz'rilla or be pounded into submission. It's a parade of 4/2 stat minions for the Hunter and here's yet another one. 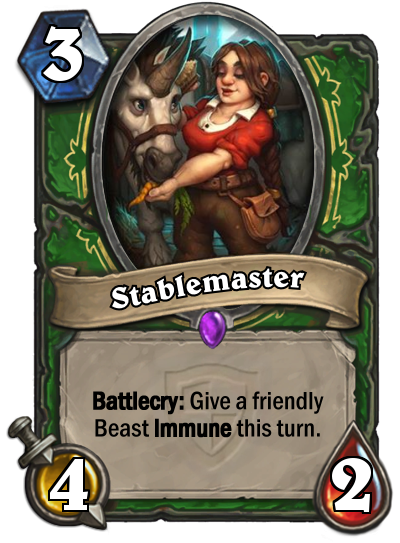 Stablemaster's effectiveness will depend entirely on having another Beast on the field, otherwise she's just a low-health minion waiting to be gobbled up. This is where it's time to start packing Stealth beasts. Jungle Panther and Stranglethorn Tiger should be the most frequent beneficiaries of the effect, which will allow them to pounce on an unsuspecting foe. If you can use this effect on Emperor Cobra for a free kill, even better. But don't pack Stablemaster into your deck just yet. Keep in mind that Bestial Wrath can not only provide this same effect (with a +2 Attack bonus, to boot) on beasts, it's also a whole lot cheaper. Stablemaster's stats are far too weak to be of any use, so think carefully about whether she's worth throwing in or leaving behind in favor of this fairly effective spell. This spell should be looked at as the little brother of Explosive Shot. On the one hand, this is a cheap way to deal with a line of enemy minions early in the game, allowing Face Hunters to better deal with opponents of their own ilk. It's definitely good for mid-range control. What's the case against Powershot? Well, Explosive Trap should serve mostly the same function, albeit once the aforementioned Face Hunters/Paladins/etc. attack directly. The same cost will also get you Unleash the Hounds, which offers far greater range for when numbers truly get out of control, with Timber Wolf offering extra punch for just one more mana. Powershot is a decent spell, but not one I'd go out of my way to acquire. For all the advantages that the Hunter seems to have, it doesn't have a lot of good low-cost minion options. 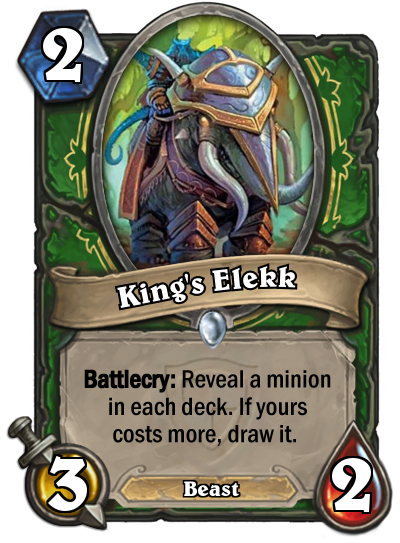 King's Elekk should at least provide a decent option with a Battlecry that doesn't offer much of a drawback. This is the Hunter's first jouster, potentially allowing them to put a higher-cost minion in their hand to save for later. 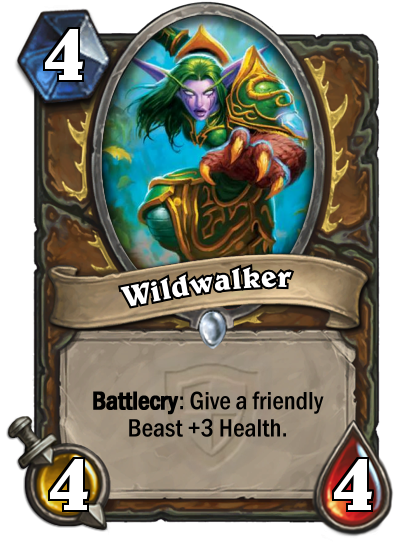 The trouble here is that Face Hunters won't get too much of an advantage from this guy, since they largely stock their decks with low to mid-range minions. In that case, the effect won't really do much good. Those Hunters will want to stock one of the more useful neutral minions that will suit their deck better. As for mid-range and control Hunters, this minion is not a terrible addition, given its decent 3/2 stats. In Hearthstone, Bear traps you! Thank you. Try the veal. So this is the latest Secret to hit the Hunter's arsenal and it appears to be a much harder-hitting version of the Paladin's Noble Sacrifice. There is one key difference, however. The Bear will spring up after the Hunter is hit in the face, meaning that initial damage will still be taken. That means the Bear Trap needs to be deployed early in the game to help take care of those low-tier minions. The wording also means that the Bear will kick in when those pesky Freeze Mages try and aim for the face. 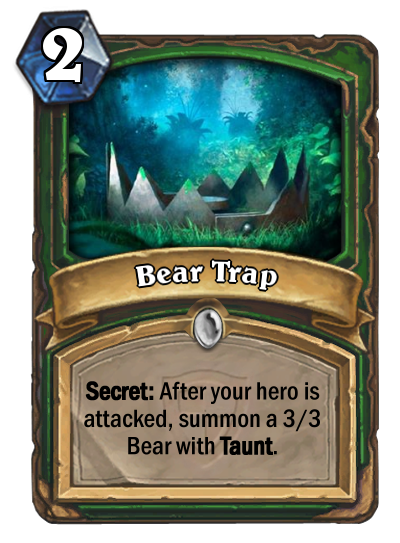 The Bear Trap can be a valuable early turn play, allowing Hunters to potentially save their Freezing Trap for more crucial late turns where they could send expensive legendaries back where they came from. It's hard to get past the initial condition that the Hunter has to take damage before this Secret kicks in, so that already puts it behind many of the other available ones out there. But an early 3/3 Bear with Taunt is nothing to sneeze at, especially if the Secret is placed there by a helpful Mad Scientist. There's still a lot of catching up to do when it comes to the Grand Tournament expansion. Shacknews will continue its ongoing analysis of these new cards all this week. Come back tomorrow when we take a look at the newest cards for the Mage and the Priest.